Just as I thought you had not shown snow falling except on GG winter, you introduce us to this. Oh, and thank you for adding three wolves. I understand that odd numbers are more asthetically pleasing, but I would rather see two of these magnificant creatures than one (probably means it has no pack-not good) as on Desert Snow and Desert Dawn. This perfectly captures the feeling of a January day, after twilight but before full night has fallen. And I love the subtle wolves. 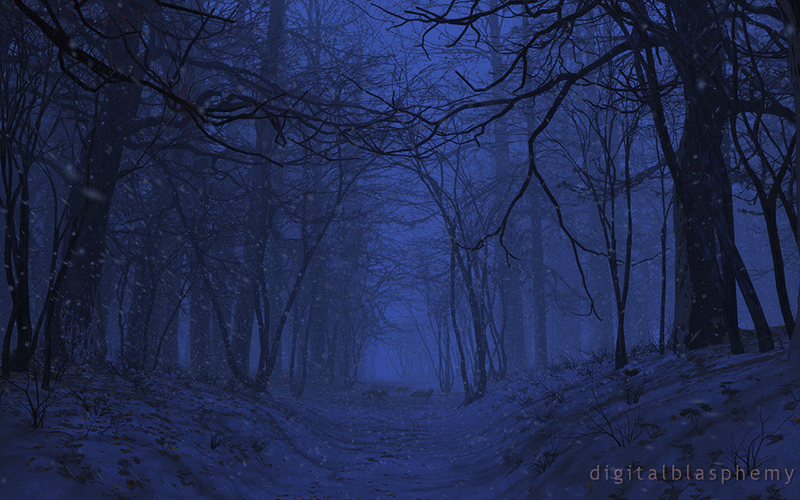 "Winter and Night are a great combo"
"Walking by Woods on a Snowy Evening" comes to mind with this one. This is a great one. i love the flying snow! Hoping for a Spring and Summer...? Ryan-- we need one more sweet abstract before the year's done, don't ya think? Something along the lines of Clockwork or String Theory, both of which continue to find their way to my desktop. Just noticed, in the multiscreen renders, the 2nd large tree in from the right hand side (not the huge on close to the camera on the far right, but the next one with snow plastered on the outside) seems to have a break in it about half way up? You can see the background through it. I think I prefer the more subdued blue in the mutliscreen render. I suppose I will crop it and use it instead. 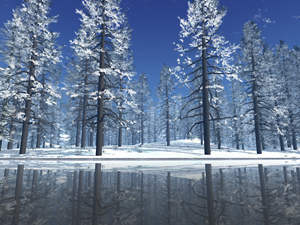 Fantastic winter scene; Elegy has been one of my favorite "nature scenes". Thanks for the multiscreen renders! "3200 x 1200 (dual 4:3)"
3200 x 1200 (dual 4:3) without the split files seems to be missing entirely, or is that resolution no-longer provided? "5120x1600 image is really 5120x1440"
This is a nice addition to the collection! It makes me want to sit next to the fire under a blanket witha nice cup of hot cocoa and read a good book. I really like having the day/night/summer/winter versions of images so that way I can set the lock screen on my iPhone/iPod/iPad as the night/winter setting and the home screen as the day/summer setting! Always impressed!! Keep 'em coming Ryan!!!! I used to go back and forth about which side of the dual-screen should contain the "focus". Some people demanded the right and others the left. As a compromise I decided to center them all (which makes for a more attractive thumbnail IMHO) and then those that want the image aligned differently can download the triple-screen file. The triple should have plenty of slack to allow centering on either side of a dual-head system. You almost always put the area of interest in the middle of the dual screen image, and it hit right at the place where my two screens are separate. Couldn't you move them over for the dual-screen view? It doesn't matter which way, just not in the middle. I think some lights in the trees plus a few other things would make this a nice Christmas wallpaper. A day version of this would be nice too. This reminds me of Robert Frost's "Stopping by the Woods on a Snowy Evening." I like this variant very much, and have this odd notion that you'll be revisiting this, Ryan, come spring and summer. Anyway, as soon as a double-screen version is up, I am absolutely adding it to my Chronowall rotation. Can't wait for the dual screen on this. The autumn version just faded onto my desktop and reminded me that you had made a winter version. I love putting the versions back to back in the slideshow order and watching the scenes fade from autumn to winter. Great work. Finally someone knows what it looks like when it snows! Love this! Although not looking forward to getting snow here in ND. One of your best scenic images. I love the tranquility it enables in my mind when I gaze at it. Hyper-excellent work! And while I'm thinking about it, on dual screen pics, don't put the center of interest ditectly in the cesnter of the picture. It inveriably hits in the middle of the area between my screens. As always, we dual screen users need one that will fit both screens. I have this advesion to using the same one on each side. Seems tacky. Ryan, I have NEVER rated an image lower than an 8 ever since I have been here, and for some reason this one doesn't cut it. I am not saying it is bad, I am just saying this just doesn't hit on all cylindrs. Digging the darker, somber moods and color palettes of late. Bravo. Just wondered if there is any chance of getting this in a duel screen version? Its great! I think it would look awesome if it were a little darker out and there was an owl sitting on one of the tree branches. Nice! The scene is quite fitting for the weather we've had in New York these past couple of days. I like the wolves. I love the wolves in this version, but I might move them closer. alot of the winter scenes have a melancholy feel to them. I'd like to see something that grabs that sunny, crisp, first frost feel that that is peaceful and joyful at the same time. Is there any chance we can start getting lossless 1920x1080 versions? As soon as the dual screen comes out, on my computer it goes. love it! The picture looks great. I love the snow falling and the wolves. Love the seasonal changes to the forest images. Excellent! We just got our first snow in Anchorage overnight- thank you! Sorry about that. The 1600 x 1200 should be showing up now! The 1600x1200 size seems to be missing. And wow! You were fast on adding those wolves, Ryan! Love them! Can't really tell, there might be something in the path in the night version. Too dark and small to tell. Two, maybe three? You have several forest pathway scenes, for all seasons. Maybe a scene with more forest animals, deer or wolves.